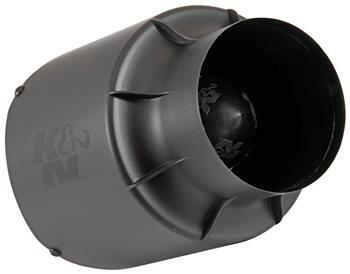 K&N’s Orion air intake system is a universal cold air intake system. The Orion assembly is designed to increase volumetric efficiency and engine horsepower. The Orion incorporates a K&N famous cotton gauze air filter which is removable for periodic cleaning and provides the benefit of an open cone filter and standard air box in one unit. The plastic injection-molded housing acts as a heat shield to prevent any power loss. Assembly designs were flow tested for many hours before our engineers completed the Orion’s shape to provide high flow with low restriction and great filtration all in a small space. Included in the box is a template to cut your own vinyl wrap for personal customization of the housing. The assembly comes with a 76mm air filter base flange and a 100mm housing intake diameter. The filter base incorporates a 1/4 inch NPT threaded fitting to attach an optional vent adapter.